Shirts With Random Triangles: A.J. McCarron hasn't spoken to Johnny Manziel since SEC Media Days. A.J. McCarron hasn't spoken to Johnny Manziel since SEC Media Days. A.J. McCarron, Johnny Manziel, and girls not named either Katherine Webb or Sarah Savage. Alabama starting quarterback A.J. 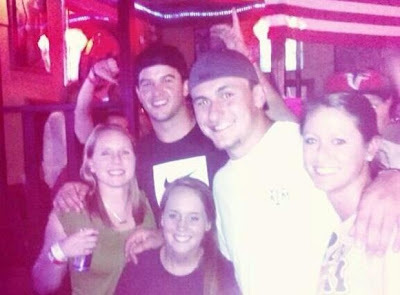 McCarron is supposed to be friends with Texas A&M starting quarterback Johnny Manziel. At least they were before all that stuff happened at the Manning Passing Academy, with JFF "dehydrating" and McCarron allegedly not waking him up and all. Apparently McCarron and JFF aren't BFFs enough to keep in touch, though. McCarron claimed on Monday during a press conference that he and Manziel haven't spoken since SEC Media Days, when the stories about the events at the Manning camp didn't quite match up. Nor was the 'Bama QB planning speak to his counterpart before the Tide and the Aggies play this weekend at Kyle Field. "It was typical McCarron nonchalance. He wasn't too concerned with anything when he spoke to the media on Monday. When asked, he said he had no plans to communicate with his friend, Texas A&M quarterback Johnny Manziel, this week. The last time the two spoke, he said, was at SEC media days in July. And then, he added: "We're just friends, guys. Y'all make this thing a lot bigger than it needs to be." You can argue that both QB's have been a little busy since SEC Media Days, but you have to wonder if the supposed friendship between the two hasn't been strained a bit over the past few months.